Monitoring traffic coming into the website is easy enough. But noticing trends takes time, and making changes to the website on the fly to get the most out of visits can be a bother, because oftentimes IT has to get involved. A startup named Spinnakr has launched to solve these problems. The tool eschews charts and graphs and instead employs machine-generated observations about site performance in real time. 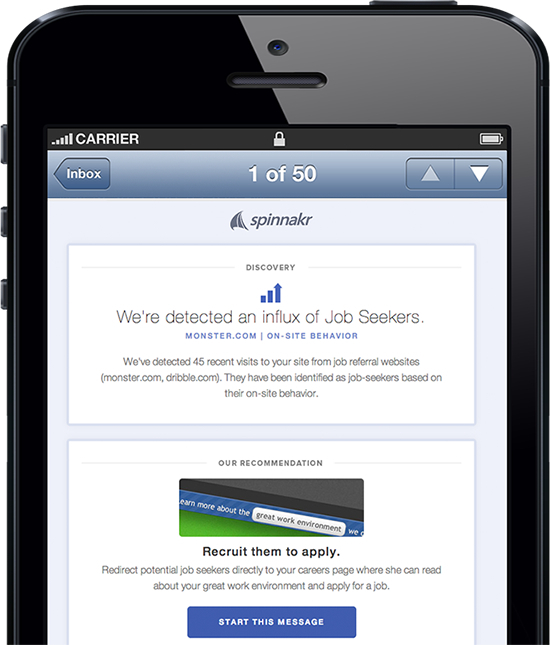 For example, it can display alerts if it thinks a site is getting hit with lots of job seekers, or potential investors. Then it recommends actions for ordinary business users to consider taking. “If there are traffic spikes that happen in real time, you just let the user know about that, and you give them the power to just type out a message, which gets automatically deployed to the website,” Spinnakr Co-founder Adam Bonnifield said. Several companies do some part of what Spinnakr does — Chartbeat and Mixpanel can perform website performance analysis, and Optimizely and other tools let customers easily modify website components — but Bonnifield thinks his company stands out, with its combination of capabilities and ease of use. “Our thesis is that, fundamentally, if you’re going to make real-time analytics actionable, you’ve got to make it so that anybody can use it,” he said. Automated analysis and a connection to optimization are critical, too. Hundreds of websites are beta users, including music.com. Andreessen Horowitz, Point Nine Capital, 500 Startups and other investors have put nearly $1 million behind the startup following its establishment about a year and a half ago. The software “pores over all the data you would otherwise ask a data scientist to analyze, and it just analyzes it as it’s being collected,” Bonnifield said. And like a data scientist, the software can suggest ways to bring in more money. Data scientists, of course, are in great demand, and they can cost a lot to keep on staff. For certain use cases, Spinnakr might be worth considering as an alternative.